When "A" makes a payment to "B", the Income Tax Department mandates that a portion of the total payment for "B" be deducted by "A" and paid to the Income Tax Department directly. This is called "Tax Deducted at Source", or TDS. Since "A" is deducting part of the payment, "A" is called the Deductor and "B", the Deductee. 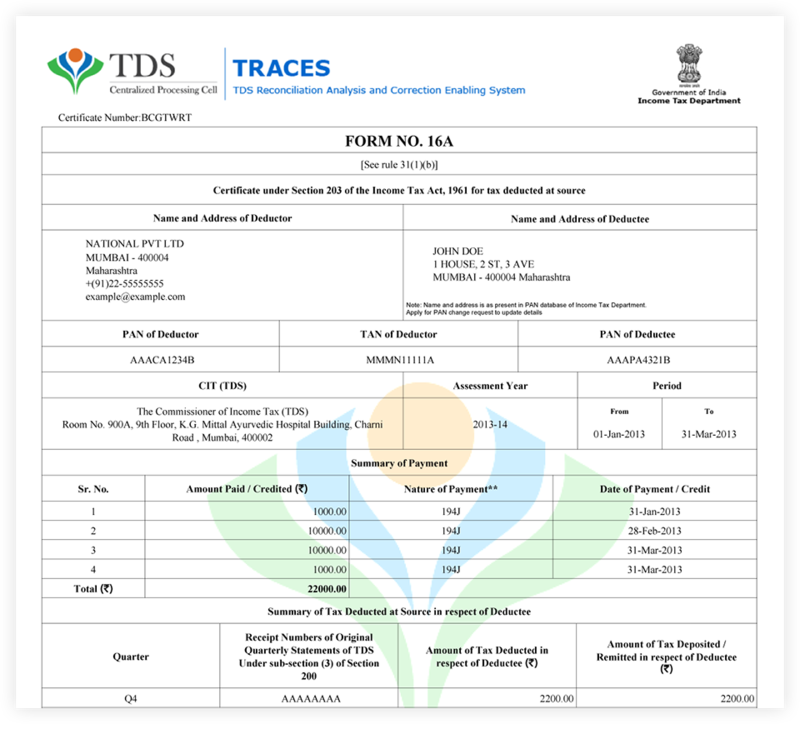 Whenever such deductions are made, the deductor makes the payment to the Income Tax Department and issues a "TDS Certificate". The Form 16A is a TDS Certificate certifying the amount of TDS, Nature of Payments and the TDS Payments deposited with the Income Tax Department. Form 16-As are issued when payments are non-Salary. TDS Professional fees, Rent, Bank Interest payments are accompanied by a Form 16A. This interactive guide will show you the different sections of the Form 16-A. Name and Address of the party that made the payment and deducted a percentage as TDS. Name and Address of the party that received the payment. PAN and TAN number of the Deductor. This is unique for every deductor. PAN of the Deductee. With this, the department knows that Tax has been paid on your behalf. Total payment made to the deductee. Amount deducted from the payment made to the deductee.